July | 2010 | Whoisliz? This is the face that haunts my dreams. I’m not kidding. Falling somewhere between Leatherface and The Scarecrow from Batman Begins exists the beast known as Vanilla Killah and he will be the death of me. *My apologies to Zippy the Pinhead, that head in a jar in Silence Of The Lambs and Sloth from Goonies for leaving you out of the comparisons. I like that this book title feels like two copy editors were arguing. Revenge, Thy Name Is Frozen Chicken Salad Rings. Top Chef had a challenge last week where the contestants had to create cold dishes. It was creatively named “Cold War” because Top Chef is in D.C. this year and everything is a political pun, which I love, but only when it’s done right. (“Cold War” was too bland for my tastes and the episode called “House Of Chef-presentatives” is like, a non-pun that actually angers me in a weird way, but the episode which featured a challenge called :Bi-Partisandwich” made me giggle a little. There is no rhyme or reason, folks.) 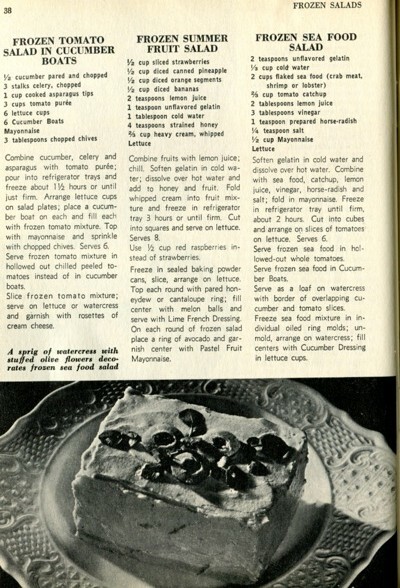 I was also incredibly disappointed that no one named their dish “Revenge” or played with that at all. But then again, this particular group of Top Cheftestants isn’t the brightest bunch. Lord, I miss the Voltaggio brothers and Yukon Cornelius Kevin and Bad-Hair-Made-Worse-By-Bad-Headbands Jen. Give them a show, Bravo, all four of them! I miss them all, and I even miss the way Jen says saveech instead of ceviche. 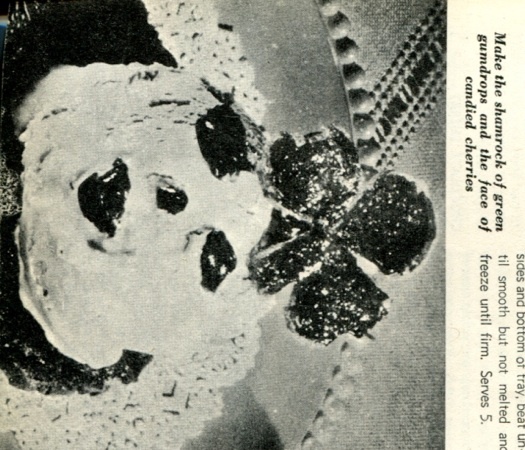 I bring up this Cold War episode though because to me, there is nothing worse than very cold food. I don’t like it. I don’t like cold pizza, I like my yogurt at room temp, and I especially hate cold meat. So when cokehead-crazy-eyes chef Amanda made a chicken terrine that actually had bits of cartilage in it AND was served chilled, I wanted to vom a little. 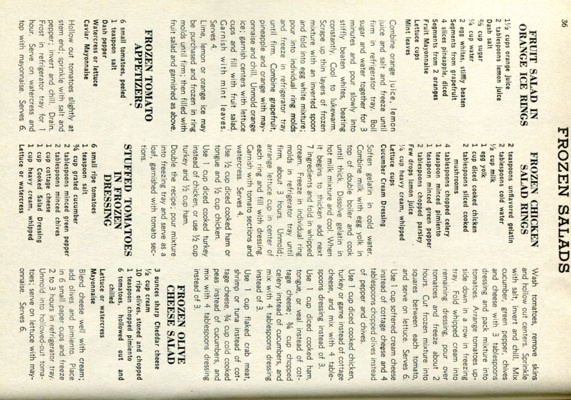 Which brings me to these recipes for Frozen Salad. I can’t think of anything worse than this concept. I mean, Jell-O salad I can handle. 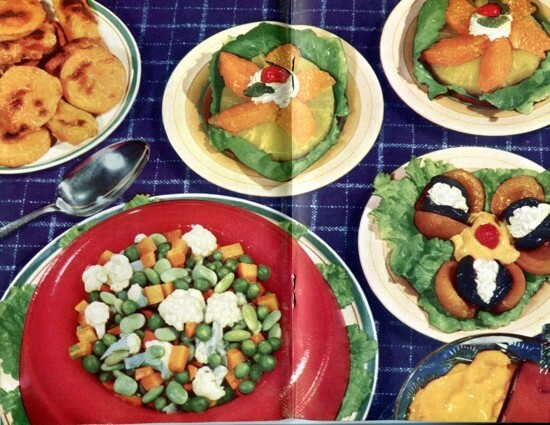 My mom made a very delicious Jell-O salad throughout the 80’s and that was cold out of necessity. (I love that I still call it a salad even though it was just Jell-O with a layer of cream cheese and nuts and fruit in it. It was served on a bed of lettuce leaves though.) 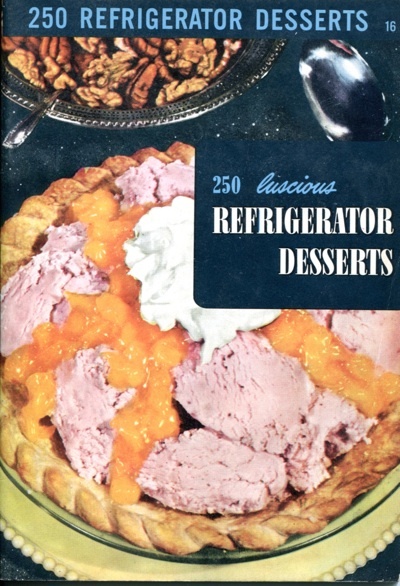 But to actually freeze meat and seafood bits with gelatin and cheese and horseradish is a travesty. And to have an entire chapter of a cookbook devoted to them is a tragedy. My angel is the centerfold.